Peter Hochachka (center) recives award from Jeff Manatt (left) of Sun Microsystems of Canada and John Fleming (right) of the college division of Prentice Hall Canada. 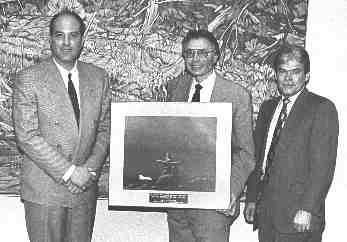 On April 8, 1995 Peter Hochachka was named the inaugural recipient of the CUFA/BC Academic of the Year Award. Dr. Hochachka was recognised for his work in adaptational phisiology (how living organisms adapt their life styles to the environment), for which he was also awarded the 1995 Natural Sciences and Engineering Research Council (NSERC) Gold Medal for Science and Engineering. The Academic of the Year Award, consisting of $3,000 to support his work and a framed print from local artist Ken Kirkby, was sponsored by Sun Microsystems of Canada and the college division of Prentice Hall Canada. Dr. Hochachka plans to use the money to purchase a computer workstation to assist with his work. Not content with restricting himself to the laboratory, Dr. Hochachka also maintains teaching responsibilities at the undergraduate and graduate levels. As well, he gives the benefit of his knowledge and experience to society directly. He has served on the board of directors of Science World, and, through the Scientists in Schools Program, he gives talks to high school students, their teachers and parents about issues in science. He also makes particular efforts to lecture in and promote research in developing countries. Much of Dr. Hochachka’s work revolves around how humans adapt to low oxygen environments. His work has attracted interest in the medical community with respect to diseases caused by, or complicated by lack of oxygen. He is currently studying the physiological adaptations of native peoples, such as the Sherpas of the Himalayas, to high altitude living. Ehor Boyanowsky, president CUFA/BC when the award was created, described the award as one way for the universities to be accountable to the public. “The bean counters have to be held at bay. If we’re really going to fulfill our mission to society as academics, we have to make plain the ways universities are accountable – through the generation of good ideas,” said Boyanowsky. Although unable to attend the ceremony, Dan Miller, Minister of Skills, Training and Labour, communicated his best wishes for the success of the award. “I commend CUFA/BC for their efforts to raise the public awareness of the outstanding contributions made by university faculty members to all aspects of society,” wrote Miller in a letter to Boyanowsky. Dr. Hochachka was selected from nine nominations submitted from around the province. The nominees spanned the disciplines: history, philosophy, psychology, mathematics, medicine, political science, education, English, and zoology.